Published: Oct. 23, 2016 at 10:47 p.m. Updated: Oct. 25, 2016 at 06:05 p.m. Opportunity is the name of the game in fantasy football. Talent matters, of course, but we want players who see a healthy volume of targets and touches to anchor our lineups, especially in daily fantasy. Every week in the second season of the Opportunity Report, we'll look at all the passing targets for every NFL team and the percentage each player owns. Franchise will handle the backfield touches section this year and his Week 7 piece is tabbed above. Seeing David Johnson absorb 13 targets tells you all you need to know about the current state of the Cardinals wide receiver corps. With John Brown on the shelf for Week 7, Michael Floyd struggling and Jaron Brown suffering a torn ACL mid-game, Arizona just doesn't have the stable of pass-catchers that it used to. Despite the discovering of a sickle cell trait in his knee, the coaching staff expected John Brown back next week to face the poor Panthers secondary. Nevertheless, this is not the deep shot offense it used to be. Palmer averaged just 7.4 air yards on his completions Sunday night, much closer the league average than in 2015. Week 7 was only the second time this year that Julio Jones handled over 40 percent of the team targets, the first of course, was his Week 4 dismantling of the Carolina Panthers. It's hard for any other pass catcher to eat when Jones is absorbing this kind of workload. Devonta Freeman was the only other pass-catcher to eclipse 20 yards on the day. With Steve Smith out yet another week, this looked like a good spot for Breshad Perriman to start to build some momentum against a slower secondary. Perriman caught just one pass, despite playing 74 percent of the team snaps. Kamar Aiken played behind the former first-round pick, but garnered one more target and was more efficient with his chances. All in all, the only receiver that has some consistency in his value is Mike Wallace. The veteran receiver has over 20 targets the last two weeks and is making plays all over the field. Robert Woods joined Sammy Watkins in missing this game, which just opened up opportunity for Marquise Goodwin. The speedy wide receiver has played well this season when given the chance. On Sunday, he also posted an average depth of target of just 13.5, which is closer to a league average figure than the number of a pure deep threat. Other than that, there wasn't much to see with the Bills passing offense. It would be wise for the Bills to continue to mix in Goodwin and his game-breaking speed when Woods returns, but Buffalo doesn't offer much volume in the passing game to distribute to its players. Brian Hoyer exited this game early after breaking his arm, which essentially put a clamp on any passing production for the Bears. Matt Barkley went six-for-15 and 81 passing yards. Anyone with a modicum of investment in the Bears passing game will need to hope Jay Cutler comes back, and comes back soon. Cameron Meredith disappeared after leading the team in targets the last two weeks. It appears he was Hoyer's guy and may not have the same value even when Cutler returns. Brandon LaFell deserves some credit after scoring four touchdowns in the last three weeks. The opportunity is there to produce opposite A.J. Green. On the other hand, he's seen target totals of just five in back-to-back games after collecting 11 in Week 5. This might be a chance to cash out on him while he's on something of a hot streak. Three of his four touchdowns came via red zone targets the last three weeks, which is a role that will certainly go to Tyler Eifert once he's fully re-integrated into this offense. Eifert played just 25 percent of the snaps in his first action of 2016. It was clear that Terrelle Pryor came into this game noticeably banged up after struggling with a hamstring injury during practice all week. Pryor averaged just 0.9 yards or separation on his four targets in Week 7, which was the lowest of any wide receiver who had four or more targets per Next Gen Stats. Pryor's season average coming into this game was a healthy 2.8 yards of separation, which is above the NFL average. With the No. 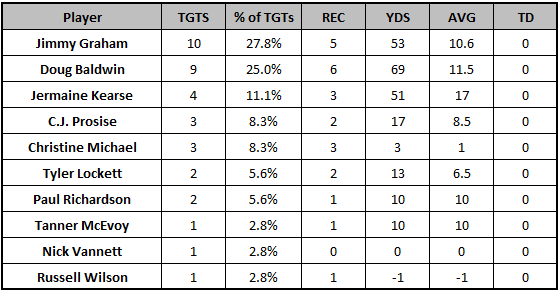 1 target struggling, only Gary Barnidge caught multiple passes and averaged over 10 yards per reception. The Browns mostly moved the ball through runs from Isaiah Crowell and their backup quarterback Kevin Hogan. The Broncos continue to have one of the shallowest passing distributions in the entire NFL, with Demaryius Thomas and Emmanuel Sanders handling a whopping 72 percent of the team targets in Week 7. It makes the two of them have incredibly reliable floors that you can count on each and every week. This was the second game in a row where Thomas saw double-digit targets, though he played four fewer snaps than Sanders. Devontae Booker played more snaps than C.J. Anderson, but they split the passing plays near even with 12 for Booker and 13 for Anderson, one of which where he lined up in the slot. Golden Tate has 22 targets over the last two weeks after having more than seven just once in the first five weeks. Tate's average depth of target in these last two games is still just 6.7. Much of his usage has been inflated with Eric Ebron and especially Theo Riddick being out. He could easily go back to the frustrating lack of usage he saw early in the season when one or both of those players return. Marvin Jones posted a solid 94 yards, but his volume is still a concern. After seeing 22 targets in the first two weeks, Jones has target totals of eight, seven, five, six and five since. Jones is still the deep threat (18.2 average depth of target) but he's become more of a hit-or-miss WR2 at this point in the season. Of course, it is worth noting that All-Star corner Josh Norman shadowed Marvin Jones on all 11 plays when he lined up out wide, per Next Gen Stats. Norman did not travel with Jones into the slot, but Matthew Stafford did not target Jones when Norman was covering him until he chucked up a 52-yard shot which Jones made a dazzling catch on. That was the play where Norman was injured and left to be evaluated for a concussion. Norman did not return, and Jones collected all of his numbers after that. 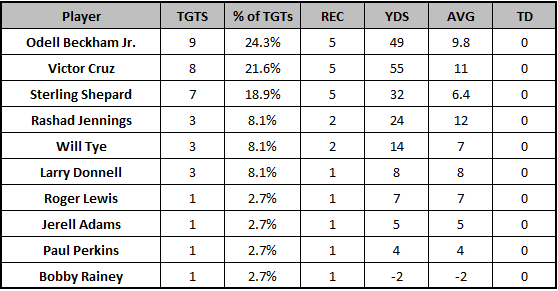 Jordy Nelson could not get open on Thursday night, as quantified by our Next Gen Stats here at the NFL. At this point, it's hard to consider him a locked-in top target in Green Bay, or even a clear No. 1 receiver in the NFL. It appears that pre-2015 Jordy Nelson is not walking through that door anytime soon. Davante Adams is certainly playing better now that he's asked to line up against inferior cornerbacks on a more routine basis. Manufactured touches for both Randall Cobb and Ty Montgomery should be staples of the offense going forward. Green Bay got a Theo Riddick-like impact out of Montgomery, and that fits what they need considering Eddie Lacy's injury situation. We expected the Broncos defense to extinguish their former quarterback and the Texans passing game, and that's exactly what happened. Osweiler's air yards differential ranked 32nd in Week 7 among all quarterbacks with -5.2 yards, per Next Gen Stats. Osweiler's intended air yards were 9.5 yards, but his air yards per completion were only 4.3. He simply couldn't push the ball down the field in the slightest, which caused Hopkins to average a measly three yards per target. It looks bad for the Texans right now, but everyone in this passing game has a shot to bounce back when Houston gets the Lions at home in Week 8. On an offense where T.Y. Hilton is the only receiving threat with any sort of established pedigree, you would think he'd be the one a defense would key-in on. It appears that the Titans chose to take a different strategy. Hilton hauled in five catches of twenty or more yards. Playing like a total stud, Hilton is on pace for 173 targets this season and has just one game where he saw single-digit looks go his way. That will come down a bit when Donte Moncrief comes back from his injury, which could be this week or next as we are now on the longer end of his four to six week expected length of absence. Jack Doyle continued the tradition of a Colts tight end going off when the other sits out. Doyle played a whopping 94 percent of the team snaps, and paced the team in red zone targets by collecting five of the six Andrew Luck distributed. He now leads the team with eight targets inside the 20-yard line on the season. What a world we live in where Marqise Lee almost doubles the yardage total of Allen Hurns and Allen Robinson combined. Lee continues to be the chain-mover for this team, primarily being used on quick drags and slants from the slot. The Jaguars can't get anything going down the field and Blake Bortles' poor play continues to drag down the duo of wide receivers who scored a combined 24 touchdowns last season. Listen, if they can't get it done against the Raiders, then this ship might have sailed until further notice. Jeremy Maclin leads the team in targets (45) by 10, but is on pace for just 888 yards on the season and has not scored a touchdown since Week 1. Despite that, he's still on pace for just four less targets than he saw in 15 games last season. There's a simple mathematical argument to be made that things could turn around for Maclin at some point, however. Maclin's 60 percent catch rate is 4.5 percentage points lower than his career average and a full 10.2 percentage points lower than his 70.2 percent mark in his first season with the Chiefs last year. Maclin's average depth of target (12.2) isn't even a full two yards higher than his 2015 10.6 mark, but his drops are up from one over the entire season last year to four in six games already this year, per Pro Football Focus. It's entirely possible that Maclin's efficiency marks start to progress towards his career marks, or this could just be the way it is going to be this year. Either way, it's worth holding onto him to find out, or potentially looking to buy him off a surely frustrated owner coming off two duds against the weak Raiders and Saints. The Rams threw over 50 passes today to just 15 carries for Todd Gurley. This is quite odd considering the makeup and desired philosophy of their team. 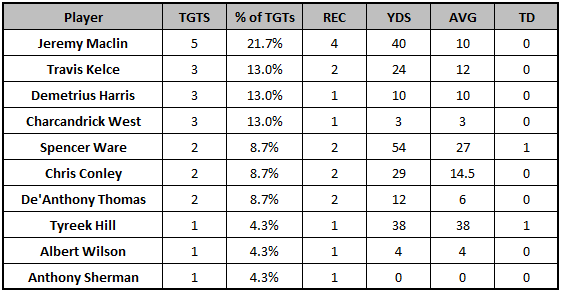 Of course, it's hard to count all of the 15 targets to Tavon Austin as traditional wide receiver targets, but the point stands. Despite seeing eight targets, this game brought Kenny Britt's streak of four catches in every contest to an end. Week 7 was really the first game in which Britt truly did not play well. After weeks of unproductive play, DeVante Parker lost playing time in this game. He played 68 percent of the team snaps to Kenny Stills' 93 percent. The team used three wide receivers on 64.7 percent of the snaps, but even that wasn't enough to vault up Parker. The Dolphins look like they've found something in Jay Ajayi as a feature back, who has run for over 200 yards in back-to-back games. If the Dolphins are going to start transitioning to a run first team, it will only slice into the volume for ancillary players like Parker and Stills. The Vikings offense struggled to move the ball with Sam Bradford under pressure throughout the afternoon. Bradford was sacked six times and hit on 12 occasions, good for 25.5 percent of his drop backs. It's the kind of mess that will get Matt Asiata eight targets in the passing game. Stefon Diggs pretty clearly is not fully healthy yet. He played 79 percent of the team snaps, which was second on the team to Adam Thielen. Cordarrelle Patterson remains a big piece of this offense, playing on 65 percent of the team snaps despite Diggs' return to the field. He's still primarily playing just one position, collecting 100 percent his receiving yards from the right wide receiver spot. But hey, the team is finally getting production out of him with 153 total yards and two scores in the last three weeks. The usage is there for Julian Edelman, who took his 10 targets for a whopping 60 yards. Edelman is on pace to see 123 targets this season and a grand total 733 yards. He's yet to score a touchdown. Having Tom Brady back in the lineup has not had a positive effect on his production. Edelman's targets per game are up since Brady returned (9.0 from 6.75). However, his average depth of target is actually down from 6.5 to 5.7. His full-season 6.1 average depth of target ranks dead last among receivers who have played 75 percent or more of their team's snaps. There's an argument to be made that positive touchdown regression is on its way, but that's tough to project with the twin towers New England has at tight end, and a power running back entrenched. It might be time to ask whether Michael Thomas is the best wide receiver on the Saints roster. So far this season, at least, he's been the most consistent since he started seeing major playing time. Michael Thomas has played 80 percent of the team's snaps since Week 3. He leads the team in that span in every relevant receiving stat with 26 catches, 323 yards and three touchdowns on 38 targets. Primarily running crossing routes and slants over the middle of the field, he fits right in with what the Saints and Drew Brees want to do on offense. All three of the Saints top receivers fill specific roles and are good players, but Thomas might be separating from the pack here soon. Since Josh Hill returned from an injury to play in Week 6, he and Coby Fleener have player 59 and 57 percent of the offensive snaps, respectively. Fleener collected just two targets in the game after garnering seven in the week prior. We have to wonder if Odell Beckham Jr. came into this came more limited than imagined. Despite Beckham taking 74 percent of his snaps a left wide receiver, Eli Manning threw the vast majority of his passes to the right side of the field. The Giants offense once again looked dysfunctional and unable to sustain any rhythm. This team is entirely dependent on Odell Beckham with the way their running game, quarterback and protection unit are playing. Geno Smith started the game but Ryan Fitzpatrick finished it after Smith sustained a knee injury. This caused there to only be 22 passing targets to go around, but 30 carries to gobble up for Matt Forte. It wasn't that Forte was great, either, as he averaged just 3.3 yards per carry. This seemed to confirm what Ryan Fitzpatrick alluded to in his postgame comments, that the coaching staff no longer has faith in him. The Jets offense will be a chore to project going forward, and we don't know what direction the quarterback position will look like going forward. After two strong weeks where he led the team in targets, Amari Cooper fell victim to Jalen Ramsey's coverage in this one. Per Next Gen Stats, Cooper caught just one pass for four yards when covered by Ramsey. The rookie corner was eventually ejected from the game, and then three plays later Cooper caught his biggest reception of the day for 18 yards. Both Cooper and Michael Crabtree will be in prime spots next week when they travel to face off against Tampa Bay. Also, keep an eye on Seth Roberts, who continues to hold onto a role with this offense, especially in the red zone. There was some talk of Dorial Green-Beckham's role expanding in the coming weeks. That did not materialize on Sunday, as the big wideout played just 49 percent of the team snaps, well behind Jordan Matthews (78 percent) and Nelson Agholor (75 percent). Green-Beckham hauled in a red zone target for a score, but it was the only one he saw on the day, which was the same amount as Matthews and Josh Huff. Nelson Agholor led the team with two, none of which he caught. We've taken shots at Zach Ertz and his underwhelming play in previous editions of this column, but we have another chance to underscore the point. Ertz registered three targets in all three games he's played since returning from injury and he played more snaps (84 percent) than any of the wide receivers on Sunday. Ertz has five touchdowns over his last 35 games. Antonio Brown was just fine with Landry Jones under center, even if he didn't have the same ceiling. Volume cures all that ails a skill-position player. With Sammie Coates struggling with a hand injury, Cobbie Hamilton stepped up to play 68 percent of the offensive snaps, and looked good on several catches. Anytime a Steelers wide receivers seemingly comes out of nowhere, we ought to pay attention. Tyrell Williams led the team in wide receiver targets and tied for the lead in snap share (88 percent). The Chargers did a lot to move him around to make sure he avoided Desmond Trufant's coverage, including targeting him out of the slot where he collected 89 percent of his 140 yards. Antonio Gates' snap share has gone up from 35 to 47 to 51 percent since his return to action in Week 5. Conversely, rookie Hunter Henry's snap share has decline in each of those weeks, going from 82 to 68 to 63 percent. This culminated in a one-catch outing for Henry while Gates absorbed 10 targets. This will be tougher situation to project going forward. Colin Kaepernick put up another solid fantasy day on the back of his 30 rushing yards, but once again completed under 50 percent of his passes. Receiving back Shaun Draughn led the team in all categories here. That's where we are at. The Seahawks were in their three-wide receiver set on 88.9 percent of their offensive plays on Sunday night. Doug Baldwin (98 percent), Jermaine Kearse (89 percent) and Tyler Lockett (78 percent) were all fixtures in the snap count. The groundwork is here for an explosive offensive masterpiece like we saw in the second half of the season in 2015. However, Russell Wilson is clearly not right and the offensive line makes it tough for them to sustain any sort of offense. If Wilson can get going, there will be more statistical value to pluck from this attack in the closing weeks of the NFL season. Mike Evans is on pace for 1,452 receiving yards and 16 touchdowns and will flirt with 200 targets on the season. He's one of the best wide receivers in the NFL this season, and Jameis Winston is locked-in on him. The first week of Vincent Jackson's absence brought new opportunity to Russell Shepard, who saw six targets in Week 7 despite collecting just four all season heading into Sunday. It's hard to suggest chasing that, as he played just 36 percent of the snaps, which was less than Evans, Adam Humphries and Cecil Shorts. We knew it would be hard to trust Kendall Wright, even if he is the team's most talented receiver, after he played only 35 percent of the snaps in Week 6. Wright played on 49 percent in Week 7, but that was still good for just third on the team. Tajae Sharpe once again led the team in wide receiver snap share, playing on 83 percent. Out of 109 receivers to play 100 or more snaps this season, Tajae Sharpe ranks 96th in fantasy points per snap. 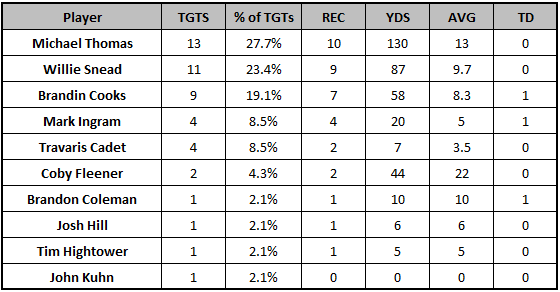 The Titans dipped Andre Johnson's snaps down to just 35 percent played on the day, but there's clearly more to be done in making the receiver corps more productive. With Jordan Reed out again, Jamison Crowder's playing time took an uptick as he was on the field for 77 percent of the team snaps. Crowder also led the team in targets and was clearly their most dynamic player in the open field. The minimizing of DeSean Jackson continued in Week 7. Now, Jackson has target totals of eight, two, seven, nine and eight since Week 3, but he has not gone over sixty yards since that Week 3 game against the Giants. Jackson's average depth of target was just 11.4 on Sunday, which is lower than usual. It appears that Jackson does not have a clear role in this offense and has fallen behind multiple players in the pecking order.